I have been meaning to write about Jeans for ages. They are such a great staple and nearly everyone wears them. But it is a difficult subject and, as I soon realised, quite a specialist subject. Rather than suggesting what brands and shapes look good on the three main male shapes (tapered, straight, or shaped) I have decided to produce another of my “What Not to Wear” blogs. People seem to enjoy these “forthright” posts the most. My general what not to wear at work for men and the what not to wear at interviews are two of my most popular posts. So here is the low down on denim. These jeans are sold like this! You can get the same effect quite quickly. 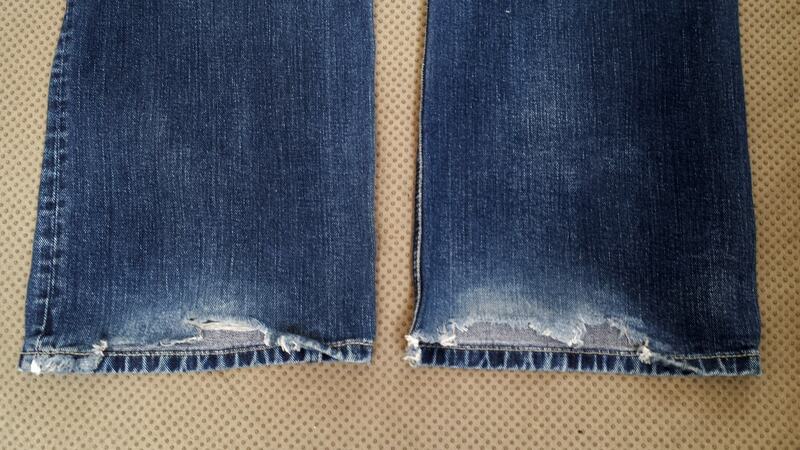 If you wear jeans that are too long for a few weeks you will walk on the hems and rub them away. This shabby look results. However it is not too hard to buy jeans in the right length for you. Men’s jeans often come in three lengths so get measured and choose the right size. However shorter, heavier men and those who are half sizes eg 32″ leg, or very tall will have to buy from specialist suppliers or pay someone competent to take them up. There is a technique for taking them up invisibly on youtube, but so long as you use the right colour of top stitching thread this job can be done at home. Chain store jeans are pretty sad, not because I am a snob, but because the styling is middle-aged, Here tall, slim, handsome American President Obama looks short and stocky in a nasty pair of “Dad jeans”, teamed with bulky white trainers. Jeans should normally be in darker shades of blue and close-fitting. And elastic anywhere is a complete no-no. That is what an “Active Waistbandband” means. Face facts. Although “jeggings” for women (an unfortunate cross between leggings and jeans) are quite popular with women, they haven’t really caught on for men. Thankfully. Because it is not a good look. We do not want or need to see every detail of the male anatomy, and the tightness on the thighs, calves and bottom is even worse. The tucked in polo shirt and riding boots emphasise the general tightness of the look on the fellow with the coffee. So with jeans – while we definitely don’t want too baggy, too tight is even worse. And although Russell Brand is quite thin, his girls’ skinny jeans are too tight and make his legs (which are shorter than his body) look even shorter. Obviously embellishment like this says something. “I am a rebel” “I am a shiny bird of prey (on its side).” Or”I like to wear a cross because I err, have faith, er, like”. Or “adolescent”. Same as so low slung that your underpants show. Naff. Old, well loved and worn traditional jeans lose some of their colour because the blue indigo dye is not completely fast. With washing and wear they fade over time. The pockets, knees, hems and other well worn areas lighten charmingly so that the jeans began to take on the shape of the wearer, like a pair of old boots. To get the authentic “faded” look you have to be someone who wears the denim almost constantly for at least six months, with minimal washing. This requires a cool life style and an outdoor, high-testosterone type job. In order to get the look without the commitment a number of youths started a trend for putting their new denims in the bath with a cupful of household bleach. This would often have a disastrous outcome. However over time the bleached look caught on. But it is truly horrible and to be avoided at all costs. Related to bleached denim are light blue denim jeans. Whatever you put them with – belts, dark shoes, tennis shoes, jackets, linen shirts – they always look horrible. I cannot find a flattering picture on the internet. Jeremy Clarkson was sacked for hitting someone at the BBC. 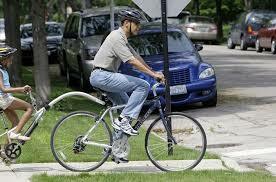 But I would say his jeans were crime enough. These two men are professional models. They are required to wear these trousers to earn a living. They work out and have nice flat tummies. Even they look horrible with their jeans too high. The waist band needs to finish two or three inches below the belly button. OK? Unless your legs are very long wear toning shoes eg dark jeans, dark shoes. If you do have long legs then a contrasting shoe can look nice eg mid blue denim with a coloured trainer, Converse or tan leather. Here are some nasty looks. 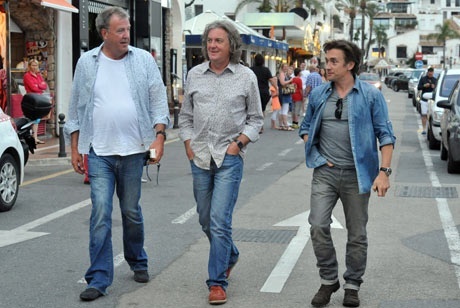 If you are a middle aged man with a big paunch who can’t do up his shirt; or you routinely wear a floral shirt, long grey hair and nut brown shoes; or if you are short and think that turn ups look good with your sunnies tucked into your T shirt you are hanging out with the wrong men. Don’t go round in a pack as it will only draw attention to your fashion faux pas, and you will look like the presenters of a terrible TV programme for men with petrol on the brain. This man loves modelling all the bad trends. Thanks for this, maybe some guy will stumble upon it before he goes shopping… Or maybe his partner will? I agree with you, there are a lot of bad choices here! You’re harsh but mostly right! I follow a few “premium indie denim” brand blogs. It’s interesting how the fit of these super-high end jeans never looks that good to me, even though the fabric and construction is fabulous. I’m specifically looking at the second pair from left in #8 which I think is from one of the companies I follow. Terrible! Who on earth OK’ed this? Men should stick with the dead simple, dark-wash, 5 -pocket Levis style. Invest in good quality and don’t wash too often. Slim but not tight. Hem neatly so there’s no drag. But some of those looks that you decree heinous, I don’t mind at all. I’ll also confess, I’ve become a convert to elastic waistbands in my venerable stoutness. I must remember the ‘active waistband’ tag. Nice! If Russell Brand can’t look good in jeans, there is not much hope for chubby men! I’m so lucky that my husband can buy a good fitting pair of jeans and only needs my help to hem them from time to time. More often than not, sloppy baggy jeans should be relegated to DIY chores around the house and not used as dress up wear to go out. I cannot get over women paying over $200 for distressed jeans with holes…is says, “I have more than enough money to dress like I am homeless”. Love you photos…couldn’t you just spend a day snapping pics of ill-fitting jeans on both sexes not matter where you live?